Strawberry rhubarb pie and cinnamon rolls are my BFFs. Because of this fact, I’ve been thinking about how to combine these desserts for weeks. Consider this their love child. It’s true love. And it’s totally breakfast. I opted for jam instead of fresh strawberries because I was scared the fresh berries would make these rolls a soggy mess. And well, that’d be so sad. I considered dried strawberries, but then I talked the idea through with my mom and we agreed that jam was the way to go. 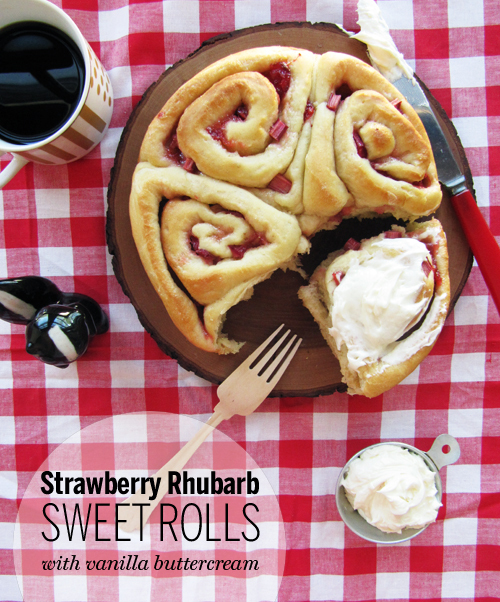 It’s a quick and simple way to get all the sugar and berries into these rolls without any trouble at all! And if you make your own jam (Freezer jam is a breeze!) then it’s basically fresh berries anyhow! So trust me about these dreamy swirls and make them before summer ends. 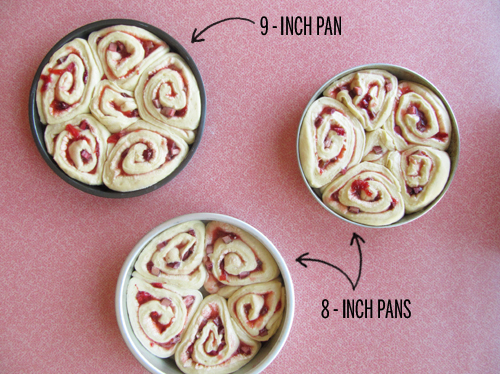 You can even assemble them at night for easy morning baking. Invite friends over! 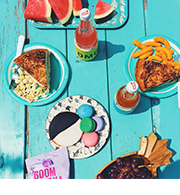 These are total brunch party food. P.S. This is what my weekend looked like. Tell me about yours! Day one. In a small bowl, proof the yeast. Whisk together 1/2 cup warm water, 1 teaspoon of sugar and 1 package of active dry yeast in a small bowl. Allow to sit for 10 minutes, until all puffy and bubbly. Day two, or eight hours later. Spray 3 cake pans with cooking spray or brush with butter. Set aside. And roll out your dough! Place the dough on a LARGE floured surface and roll out (until about and eighth of an inch thick rectangle). Spread evenly with the 3 tablespoons softened butter using a spatula. 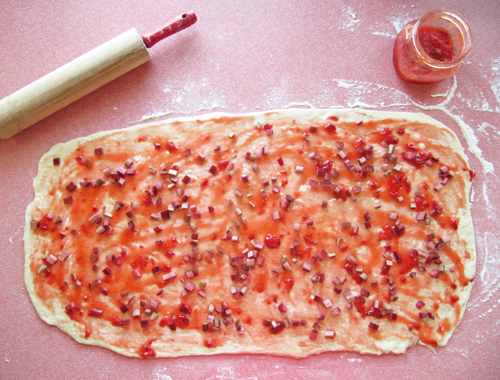 Spread jam over the dough and sprinkle with rhubarb. Roll up, slice and place in the prepared cake pans. Cover with a towel and allow to rise in the pan for 30-60 minutes or until they’ve just about filled out the pans. You want the rolls to have risen enough to be touching each other, but it’s ok if they haven’t completely filled the cake pans, considering they will rise in the oven. Meanwhile turn the oven on to 350 degrees F and bake the rolls for 22 – 35 minutes, rotating positions in the oven. If you’re not sure they’re done poke the center and make sure it’s not doughy. Allow to cool in the pans for a few minutues and then invert onto a cooling rack. Be sure to allow them to cool completely before covering, to prevent sogginess. These are best right out of the oven, but keep well if wrapped tightly for 4 days or so. Mix butter and powdered sugar until combined. Add vanilla and milk 1 tablespoon at a time until thickened. Top sweet rolls as you serve! I looooove the idea of using jam instead of fresh berries. Strawberries definitely make baked goods soggy sometimes and that’s a great hack for it. Smart smart smart. I wish I had one of these right now; they look so soft and yummy. 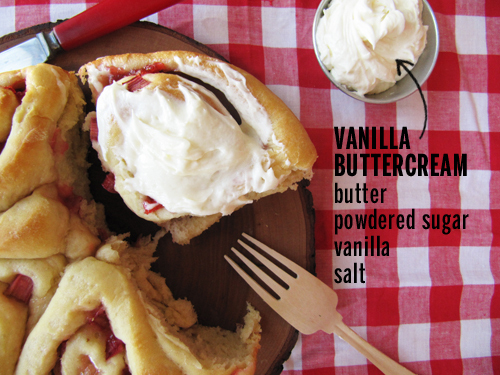 I love that you incorporated fresh rhubarb into the jam and then covered the roll in buttercream. I can’t imagine these could be improved in any way. Nice work averting a soggy fruit mess! These look fantastic. As a lover of all fruit desserts, this makes my heart skip a beat! 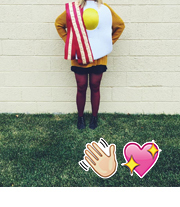 Oh man, these would totally be your valentine, Nicole! I need those rolls in my life! Freak’n brilliant. Love me some rhubarb and strawberry combo. Thanks girl! And yeah. 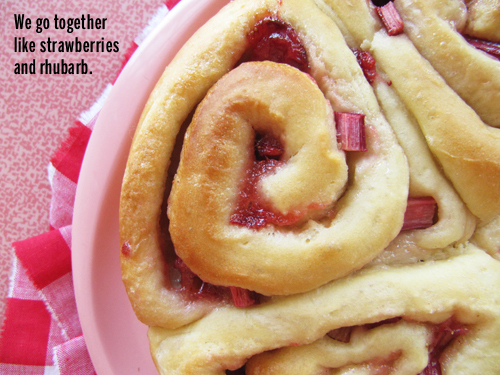 Strawberries and rhubarb were meant to be! I always make strawberry and apple concoctions, but rhubarb is my favourite pudding filling so I’ll definitely be making this! Oh! I bet you’ll love these then! Holy schmoley that looks amazing!! Thanks! I bet you’d love these so much! these are just the prettiest of the breakfast rolls! way to dial in that mom-wisdom! Yeah girl! Mom’s just know! We totally collaborated. I don’t know if you watch Real Housewives of New York, but, Ya Ha Be Be. P.S. That dough looks out of control delicious. ha! Now I need to watch that show! Rhubarb in cinnamon rolls? Topped with vanilla bean butter cream? My mind has just been blown. Thank you. I discovered this recipe (and your site) thanks to shutterbean’s friday shout-out. OMG. these were INSANE. I am forcing my friends to take them off my hands before I eat them all. because I really will. did I mention that I made them with my homemade strawberry jam? SO GOOD!! Yay! I’m so glad you made them! And hell yeah with the homemade strawberry jam. <3! This sounds absolutely incredible!!!! I cannot wait to make these for brunch with girlfriends. Yum! Yeah! They’d be perfect for a lady brunch.